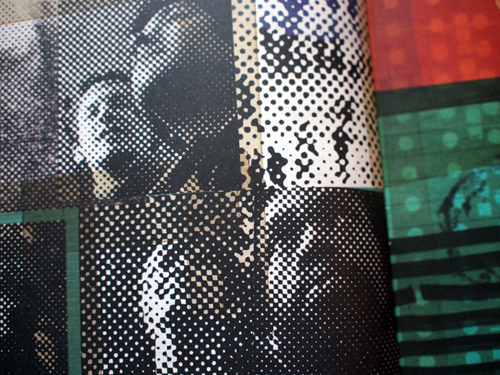 The graphic design is done by Julian House at Intro, who is no stranger to music related projects. He has worked with many bands in his time at Intro, as well as setting up a label, Ghostbox, which bares all the visual hallmarks of his distinctive 1950s styling. Although it is a term I usually try to avoid using, but ‘retro’ can appropriately be applied to what he does for Ghostbox releases and label identity. 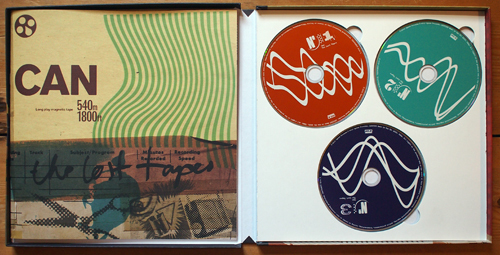 Here for Spoon Records he has created a handsome and sturdy 10″ box to house the 3 disc set, with accompanying 28 page booklet. The box itself, obviously recalls reel to reel tape boxes, which helps set an ‘authentic’ tone of voice for the whole project. 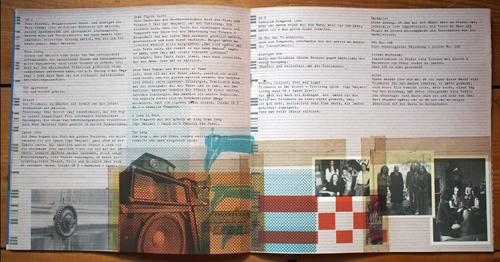 The front and back cover theme of cut and paste imagery, with yellowing Sellotape and halftone-screened photographs follows through into the internal graphics perfectly emulating the immediacy of much of the music—Can famously jammed a lot of their material, and the visual language applied to The Lost Tapes mirrors that aesthetic. 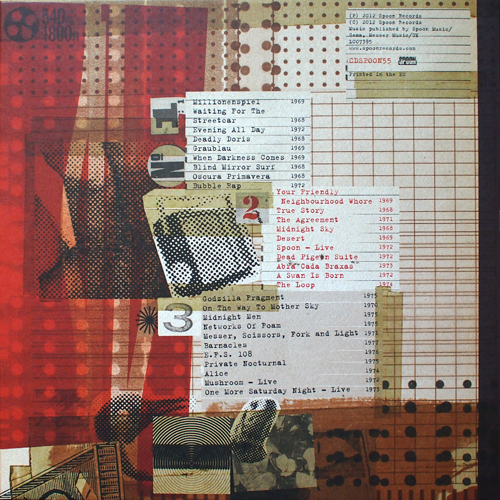 It could be argued that this showcases the House style, (pun intended), with the typewriter font, cut and paste approach and seemingly random placements, that he established with his work for Broadcast and Primal Scream. Certainly there are similarities with what he has done before, but the trick with much of his output is to make the work look as if it was thrown together, when in fact there is obvious consideration and a keen designers eye employed throughout. 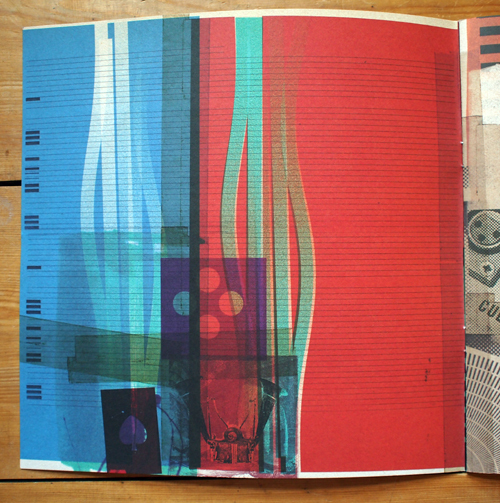 Image selection, editing, cropping and placement rarely look this good when they are done spontaneously—making an attractive scrapbook is not easy. 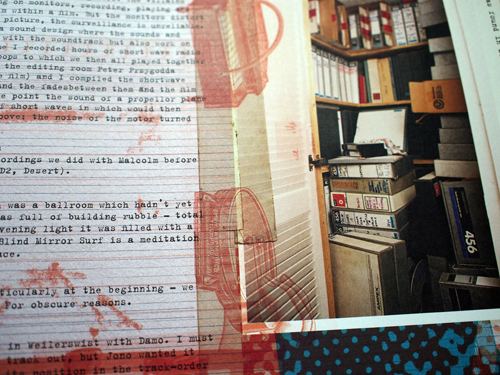 Uncoated stock helps to instil a tactile sense as the viewer holds this oversized CD packaging to read the comments from band members about the selection process they went through to edit down 50 hours of music contained in the uncovered tapes. There’s even a photograph of the cupboard they found the material in. It is remarkable that so much survived, considering that during times of little money, the band would record over old tapes they had decided weren’t worth preserving. This is probably one of the major releases of 2012—expect it to keep cropping up in many end of year polls. And as such, it is good to see that the importance of creating visually empathetic packaging for the discs has been held in such high regard, something rare in this era of imageless digital downloads. I would have bought this as a physical release regardless of the packaging, as I do for all albums that I consider audio quality to be of importance for. But regardless of wanting to possess high quality audio, this package is well worth £30 of anyones money in my opinion. 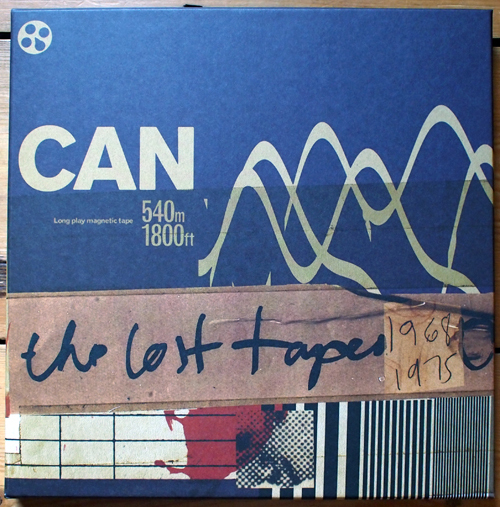 For the first time in a long time, when I stuck on my headphones to listen to the first CD from The Lost Tapes and study the sleeve notes and artwork, I was taken back to a time when I used to do the same with vinyl LPs.